For smaller websites who want a more regional focus in an industry with low to medium competition. The Rank 1 package offers a hyper-focused insight into what needs to be implemented on your website. We provide off-page development as well as the on-page optimisation, all designed to work in unison to boost your online presence. This SEO package is suitable for smaller websites who want a more regional focus in an industry with low to medium competition. 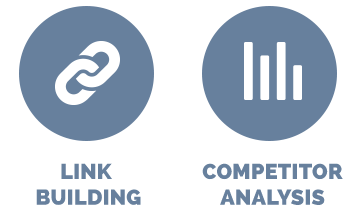 Ongoing great quality and highly relevant off-page link building to increase the awareness of your site. In depth Competitor Analysis report compiled to establish the best strategy for your goals. NOT DECIDED? VIEW OUR RESULTS! In-depth Keyword Analysis Research to find the best keywords for your campaign with ongoing reviews and checks. Detailed Technical Audit of the site, allowing us to find any potential issues with the site from a coding viewpoint. Client Area where you can login, access important information, see outstanding technical work and liaise directly with the technicians. Site Optimisation on the agreed relevant keywords and region with regular ongoing technical checks. Google+ Local Setup, optimisation and a guide to help you improve your local presence on Google. Regular Monthly Reports showing your current Google positions and progress. Google My Business Set up or Update to improve your Google map listing. We also offer a range of additional services which you can choose from to add more depth to your online marketing strategy, such as PPC Advertising, Social Media Marketing and Conversion Rate Optimisation (CRO) strategies – please take a look to see what else you could develop to help increase your searchability, brand and awareness. I agree to receive marketing emails from 123Ranking.